Tonight, after midnight, there will be a total eclipse of the Moon. 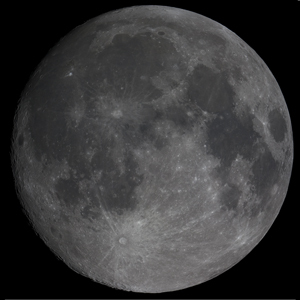 The Moon will first intersect Earth's umbra at about 1:33am and will fully emerge at about 5:00am. Totality will last from 2:40am to 3:50am. The weather for much of the US looks bleak but here on the east coast we might be lucky although blustery winds will hamper high powered photography. In preparation, I took the picture shown here last night. It's the first picture I've taken with my Canon DSLR (Rebel XSi) attached to my 10 inch reflector telescope. It's a mosaic of two frames (northern and southern halves). Each frame was a 1/80-th second exposure at 100 ISO. Click on the image to see the full-sized version.